HBO 2019 movies and shows are going to be a part of everyone’s water-cooler banter over the next few months. 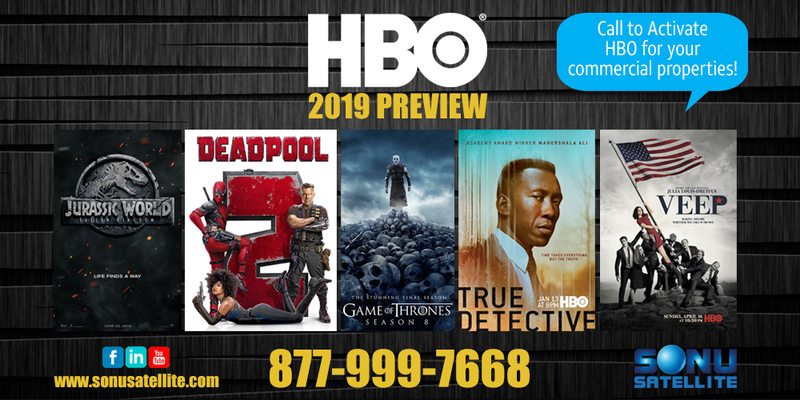 With new HBO movies and HBO tv shows ready to raise the bar for all entertainment, your business is sure to benefit from having HBO content playing. New movie additions include Deadpool 2, Ocean’s 8, The Meg, Jurassic World: Fallen Kingdom, The First Purge, and more, continuing HBO’s dedication to providing blockbuster Hollywood hits. Although, we think the real news is in the list of TV shows dropping in 2019. Game of Thrones, Veep, True Detective, High Maintenance, Crashing, and Barry are just a few of the smash hit TV shows airing new seasons, and the buzz could not be any bigger for this list. Game of Thrones Season 8 is set to be the final chapter of everyone’s favorite gruesomely dramatic medieval fantasy. Information on the opening episodes of GoT Season 8 is scarce, but news has been leaked that they will be both longer than normal and also include the largest battle scene in Game of Thrones to date. Prepare yourself for the official release in April 2019! True Detective Season 3 stars Mahershala Ali, who you will most likely remember as “Richard Tyler” from The 4400. Season 3 promises to bring viewers back to what made the first season such a huge hit, cutting the fluff and immersing us back into the relentlessly dark universe of True Detective. HBO has the programming and original content that keep your customers both in and on the edge of their seats. Contact Sonu Satellite for free quotes and details on providing HBO 2019 movies and tv shows within your office, hotel, motel, hospital, restaurant, bar, and all other commercial properties. Call the number below, or use the free quote form by clicking the blue button.